Greek yogurt makes a great breakfast, snack, or dessert, and especially when mixed with other nutritious ingredients like fresh fruit, granola, and toasted seeds. Experimenting with Greek yogurt as a way to boost protein intake doesn’t have to end there, though. It’s easy to integrate this dairy “superfood” into just about any meal as a sauce, dressing, party dip, topping, or even frosting. It’s even great for baking because it’s a viable substitute for butter or oil for irresistible homemade baked goods, including chocolate chip cookies! I’m all about including some dessert in my daily meal planning and this tasty treat is a healthy and homemade way to enjoy the ice cream experience without all the calories. 1. 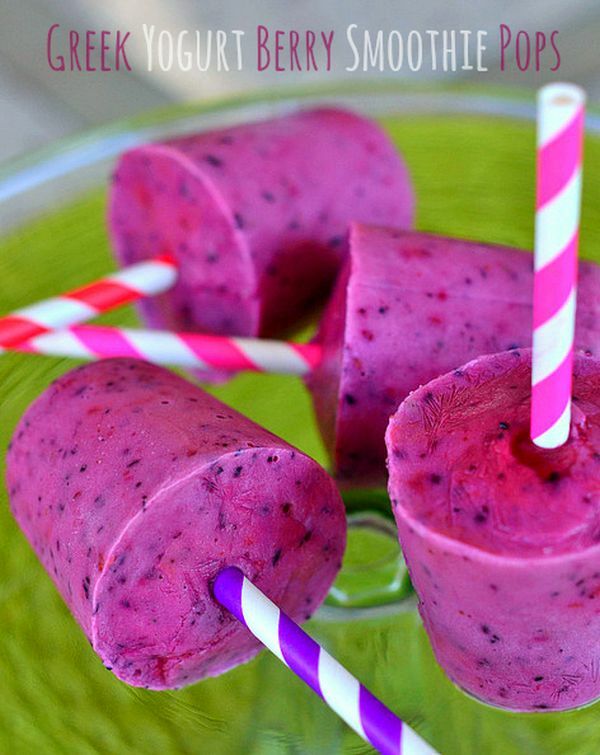 Blend vanilla yogurt, milk, and berries until mixture is fairly smooth. Pour into 3-oz. paper cups. 2. Set in the freezer until the berry Greek yogurt mixture is almost firm. Insert a stick or skewer in the center, and continue freezing until solid. 3. Gently tear the paper cup off of the frozen yogurt pop, and enjoy immediately. Whether you’re having a fancy get-together or a solo Netflix party on the couch, you can’t go wrong with chocolate. A bowl of this creamy yogurt dessert dip will make any spread of cookies, fresh cut fruit, and marshmallows even more enticing. 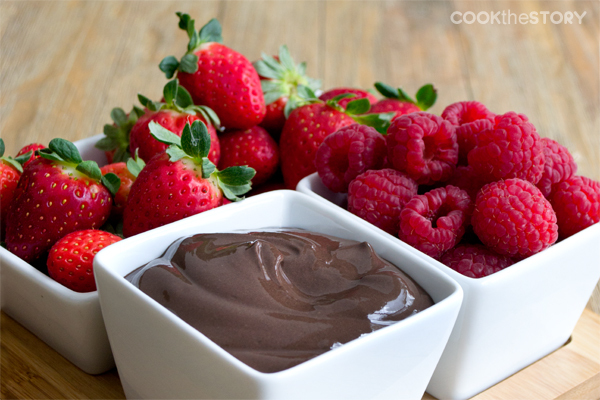 And even though it’s sweet and decadent, this chocolate dip is a much healthier and lighter way to cap off a filling dinner than chocolate cake or a box of truffles. 1. Add the Greek yogurt to a medium-sized bowl. Stir in the cocoa powder, brown sugar, vanilla, and cinnamon. Stir until it is an even color and the sugar granules have dissolved, about 3 minutes. 2. If desired, mix in a little bit of ground cayenne or chipotle pepper. This shouldn’t make the dip spicy, but if you prefer a Mexican spiced chocolate flavor, add up to ¼ tsp. When the mood strikes for pasta drowning in creamy sauce, chances are you immediately reach for alfredo. 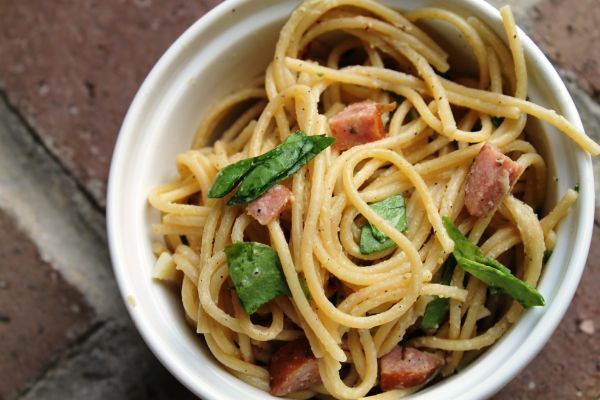 But you can make a simple carbonara with yogurt instead. To make the Greek yogurt pasta sauce, stir it together with Parmesan cheese, salt, and pepper. Crack in some eggs, and you’re ready to add cooked pasta for the completed dish. 1. Boil a pot of salted water, and cook the pasta according to package directions. Just before you drain it, scoop out at least 1 cup of hot pasta liquid. 2. While the pasta is cooking, fill a kettle of water and bring it to a boil. Empty the boiling water from the kettle into a large bowl to warm the inside. 3. Meanwhile, warm the olive oil over medium heat. Add the Canadian bacon, and cook just until it starts to brown. Remove it from the heat, and set it aside. 4. A couple of minutes before the pasta has reached desired doneness, dispose of the hot water from your large bowl by pouring it down the sink. To that bowl, immediately add yogurt, Parmesan, salt, and black pepper. Stir it around, and then crack in the eggs. Whisk it all together with a fork. Add the Canadian bacon. 5. Don’t forget to scoop out at least 1 cup of the pasta water. When the pasta is cooked, strain it and immediately add the hot noodles to the egg mixture. Stir to combine so that all noodles are well coated in sauce. If the sauce seems too thick, drizzle in some of the reserved pasta liquid, a couple tablespoons at a time until you get the right consistency. 6. Serve the carbonara at the table alongside a bowl of grated Parmesan and a peppermill so that people can dress the pasta to their liking. Any yogurt can be used to make labneh, a rich style of soft cheese. But since Greek yogurt has already been strained, the cheese-making process will be a little easier and a little faster. This sweetened labneh is ideal for a dessert or unique side dish at brunch. 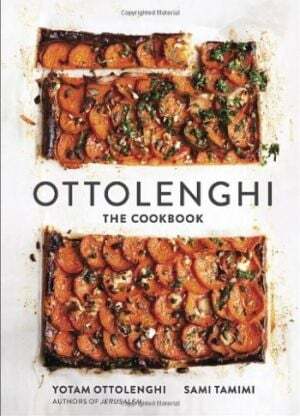 For a traditional labneh recipe made with olive oil and mint, along with other dishes that honor the diverse culinary traditions of the Mediterranean, add Ottolenghi: The Cookbook to your collection. 1. Put the yogurt in a bowl with the icing sugar and salt. Mix well, and transfer to the middle of a clean muslin or linen cloth. Tie into a bundle with an elastic band or string, and hang over a bowl in the fridge for up to 18 hours. 2. Preheat the oven to 350°F. 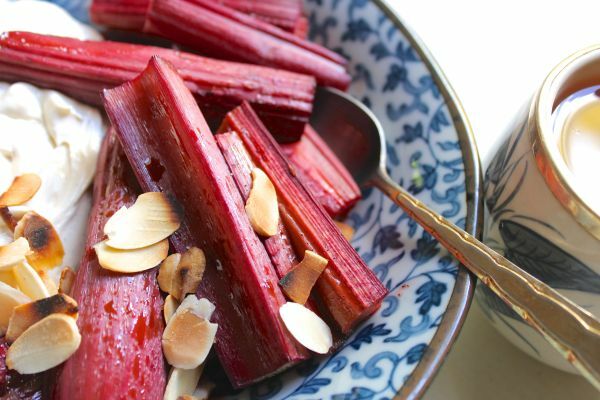 Mix the rhubarb batons with the wine, sugar, vanilla, and lemon zest strips. Put in an ovenproof dish that’s just large enough snugly to accommodate the rhubarb and roast, uncovered, for 20 minutes, until tender but not mushy. Set aside. 3. Just before serving, give the yogurt a good squeeze to release the last of the water. Remove from the cloth and place in a bowl. Stir in the grated zest and spoon on to plates. Top with the rhubarb and some of its cooking juices, and sprinkle the nuts on top. This salad is a well-balanced meal with spinach, avocado, tomatoes, and cucumber. But it isn’t all about the veggies. On top of those nutrients, there are plenty of protein sources like chickpeas, feta, beef, and a dressing made mostly of Greek yogurt. Not only is this recipe a delicious way to get into salad, but the basic ingredients of peppered steak, creamy lemon dressing, and simple greens will make a great base for other mix-ins too. 1. In a small mixing bowl, whisk together yogurt, garlic, lemon zest, olive oil, vinegar, thyme, salt and pepper until smooth. Slowly stir in up to 3 tablespoons of water so the dressing dribbles off a spoon. Let stand at room temperature at least 15 minutes to develop flavors. (Can be made up to 2 days in advance and stored in the refrigerator.) Makes 1 cup of lemon-yogurt salad dressing. 2. To prepare steak, preheat a gas or charcoal grill for high heat, pat steak dry, and season with salt and pepper. Grill 4 to 5 minutes per side for medium-rare. Transfer to a plate, and let rest 10 minutes before slicing into thin strips. 3. To prepare salad, make a bed of baby spinach on a large serving platter, and sprinkle on parsley. 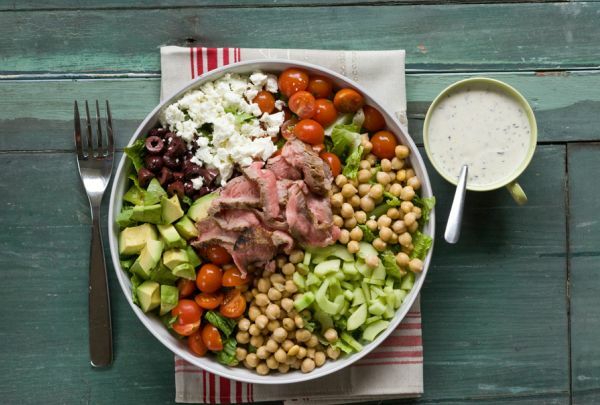 Arrange cucumber, tomato, chickpeas, avocado, olives and feta in mounds, and place steak strips in center. Serve with a large spoon for guests to make their own mix, and pass dressing on the side. Cake for breakfast? 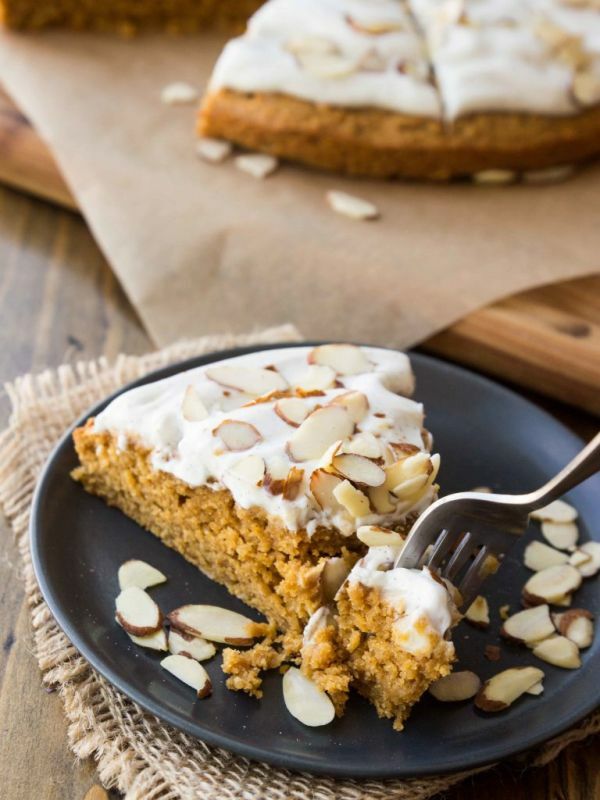 That’s right, and it’s packed with pumpkin puree, oats, and almonds and then topped with Greek yogurt frosting. And even if you cut calories by skipping the layer of icing on top, you’ll still get a little Greek yogurt since it’s also included in the pumpkin cake. 2. Whisk together the flour, oats, baking powder, pumpkin pie spice, and salt. Set aside. 3. In another bowl, beat together the pumpkin and almond butter until smooth. Mix in the brown sugar until fully incorporated, and then add the egg and extracts. 4. Gradually add the dry ingredients to the wet mixture, scraping down the sides as necessary until just incorporated. Fold in the Greek yogurt. 5. Line a 9-inch round cake pan with parchment paper, and grease the bottom and sides liberally. Add the batter, using the back of a spoon or spatula to spread it out and push it into the sides. Since the batter is thick and doesn’t spread much, make it as even as possible. 6. Bake for 25–30 minutes until a knife or toothpick inserted in the center comes out clean. Let cool until just slightly warm to the touch. 7. For the glaze, whisk together the yogurt and powdered sugar, and then whisk in the vanilla bean seeds. 8. Top the cake with the glaze, and sprinkle on slivered almonds. Cut into 8 slices. Science says there’s no need to cut butter out of your diet completely, but everyone with a constant craving for chocolate chip cookies (which is everyone, right?) should whip up a batch from scratch with a lower-calorie substitute: Greek yogurt. If you choose the plain non-fat variety, as the recipe calls for here, you’ll be cutting 7.5 grams of fat per cookie as compared to the common Nestle Tollhouse variety. 2. In a medium-sized bowl, sift (or whisk) the flour, baking soda, and salt to combine. Set aside. 3. In a large mixing bowl, beat together the eggs. Add the sugars until dissolved. Stir in the Greek yogurt and vanilla extract. 4. Gradually add the dry flour mixture to the wet ingredients. 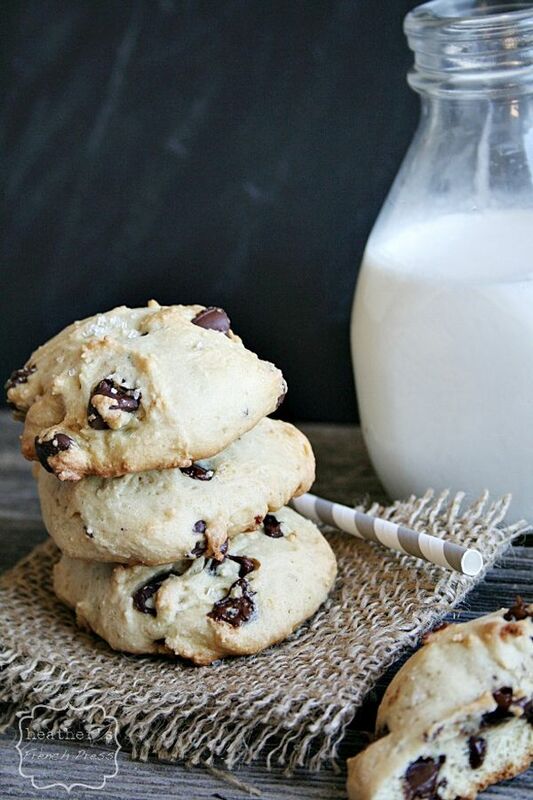 Once all ingredients are almost fully incorporated, fold in the chocolate chips. 5. Drop the cookie dough onto a parchment-lined baking sheet. Bake in the oven for 9–11 minutes. 6. A minute or two after removing the pan from the oven, transfer the cookies to a wire rack to cool. What did you think of these healthy Greek yogurt recipes? Have anything else to share? Let me know in the comments below!